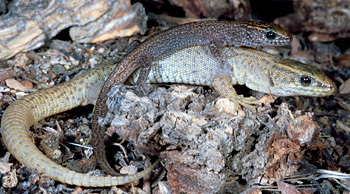 Desert night lizards live in family groups. Pictured above is an adult female with her 3-day-old offspring. Photo by Mitch Mulks. Researchers captured more than 2,000 lizards during the study. 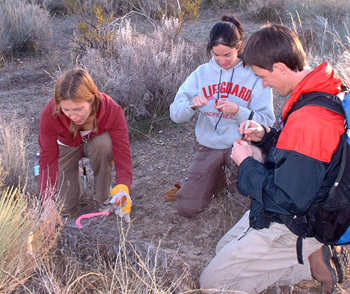 Pictured above (left to right) are UCSC graduate students Christy Hipsley, Alison Davis (now at UC Berkeley), and Ammon Corl. Photo by Mitch Mulks. Researchers at the University of California, Santa Cruz, have found that a species of lizard in the Mojave Desert lives in family groups and shows patterns of social behavior more commonly associated with mammals and birds. Their investigation of the formation and stability of family groups in desert night lizards (Xantusia vigilis) provides new insights into the evolution of cooperative behavior. The researchers reported the results of a five-year study of desert night lizards in a paper published in the Proceedings of the Royal Society B: Biological Sciences (published October 6 online in advance of print). Alison Davis, who led the study as a graduate student at UC Santa Cruz and is currently a postdoctoral researcher at UC Berkeley, said one of the unusual characteristics of desert night lizards is that they are viviparous, giving birth to live young instead of laying eggs. What really got her attention, however, was that both young and old lizards could be found huddling together every winter beneath fallen Joshua trees and other desert plant debris. "This is remarkable, given the fact that in most species of lizards, individuals actively avoid each other," Davis said. By conducting extensive genetic analyses of these winter social groups, the researchers found that young desert night lizards stay with their mother, father, and siblings for several years after birth. Some groups aggregated under the same fallen log year after year, forming what the researchers termed dynasties. According to Davis, about 20 lizard species are thought to form family groups, and only two of those lay eggs. Viviparity (live birth) is crucial for the evolution of cooperative behaviors, she said. "Viviparity provides the opportunity for prolonged interaction between the mother and offspring, which predisposes the animal to form a family group," Davis said. "The importance of parent-offspring interaction fits with what is currently understood about evolution of family groups and cooperative behaviors in birds and mammals." In a classic study of animal social behavior published in 1995, Stephen Emlen of Cornell University described the evolution of family groups in birds and mammals and identified common themes and rules seen in both classes of animals. Davis's findings suggest that the same rules also apply to reptiles, which were not considered in Emlen's theory. "Biologically, lizards are very different from both mammals and birds, yet a few species of lizards have evolved a social system around nuclear family members that is nearly identical to what we see in ground squirrels, primates, and woodpeckers," Davis said. Coauthor Barry Sinervo, professor of ecology and evolutionary biology at UCSC, said this similarity between widely separated groups of animals makes the findings particularly interesting. "Establishing a common pattern for how kin-based groups and cooperative behaviors evolve across different taxa gives us an invaluable tool. It helps us to predict where similar group behaviors may be found in other species," he said. The researchers faced some daunting challenges in their quest to understand the family ties that bind desert night lizards. The first hurdle was to capture the lizards. Adults, which are three to five inches long from the snout to the tip of the tail, are not so hard to find. The babies, however, are tiny, about the weight of a toothpick, and perfectly camouflaged, with skin the color of the sand where they are typically found half buried. "You have to know what you are looking for," Davis said. She and other graduate and undergraduate students in the Sinervo lab looked under hundreds of logs in search of their shy subjects over the course of five years. They eventually marked 2,120 individual lizards for use in the study. The second challenge was to determine if lizards living in aggregations were actually related and, if so, how closely. Davis worked with Yann Surget-Groba of Bangor University (U.K.) to sort out DNA microsatellite information collected from each lizard aggregation. She recalled Surget-Groba's amazement when he finished his analysis on one particular aggregation of 13 lizards and exclaimed, "They're all related!" In this paper, the researchers did not address the advantages of baby lizards staying with their mothers for the first few years of life. The young appear to feed themselves and receive no direct care from parents or other siblings. But Davis said that she suspects there are some survival advantages to the group living arrangement and plans to address that subject in a future paper. "Determining the fitness consequences of kin-based social groups in this species will be an important next step," Sinervo said. For now, Davis said she hopes that her study will broaden the appreciation of these unusual animals among scientists and the general public. "Anyone interested in animal social behaviors will be interested in this species," she said. In addition to Davis and Sinervo, the coauthors of the paper include Ammon Corl of UC Santa Cruz and Yann Surget-Groba of Bangor University and the University of Geneva, Switzerland. The study was funded by a grant from the American Museum of Natural History; awards from the American Society of Ichthyologists and Herpetologists and from the U.S. Department of Education; and an NSF postdoctoral fellowship in biology.